It has been a long time since I updated the blog. A lot has been going on - and I will save you the trouble of reading about it all. Quick highlight - Marcia Dougherty and I each won a blue ribbon at MQX East in April 2017. This was a major surprise for both of us - and it is a major accomplishment - something I had hoped for, but wasn't sure would ever happen. And it was truly special for Marcia since it was the first time she ever had a quilt judged! Great job Marcia! And now I am shutting down the longarm quilting side of my business. After ten years of customer quilts, it is time to work on my own things, and during my studio clean-up I found more kits than I remembered I had - so I'll be busy for a while! I have a couple ideas I want to try for the business, but need dedicated time to work on them to see if they go anywhere, so watch this space! Until then, a big "Thank You" to all my many customers who have kept me busy all these years. I hope you have lots of fun and create gorgeous quilts - and may your bobbin never run out mid seam! Happy Quilting Everyone! May your heart be filled with gratitude and your tummy be pleasantly filled with your favorite goodies! I am sad to say the Guild Board decided to cancel the Delmar QUILT Inc Quilt show scheduled for April 2015. 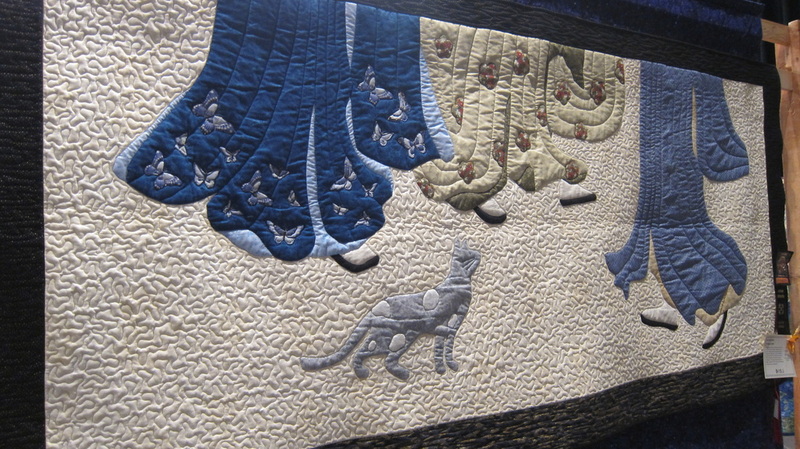 The Delmar guild quilt show has always been one of the best in the area, so I am sure that I will not be the only one to be disappointed to hear of it's cancellation. And from the quilts that I had seen and knew would be entered, this year's show would have been a good one. The guild president will be surveying the membership to determine what they want to do going forward. There are several options available - time will tell what decision is made - and of course, I will forward any info I find out about it. If you are looking for another quilt show "fix" in April - I recommend heading to MQX East in Manchester, NH. MQX was originally a machine quilting show, but has since expanded to all forms of quilting, and even additional locations, so we don't have to wait a full year. They have a ton of great classes, great vendors, and AMAZING quilts! Check out their website for more info: http://www.MQXShow.com - and tell Janet-Lee and Mary that "My Quilting Lady" sent me!" Last Day of Sale - Don't Miss It! 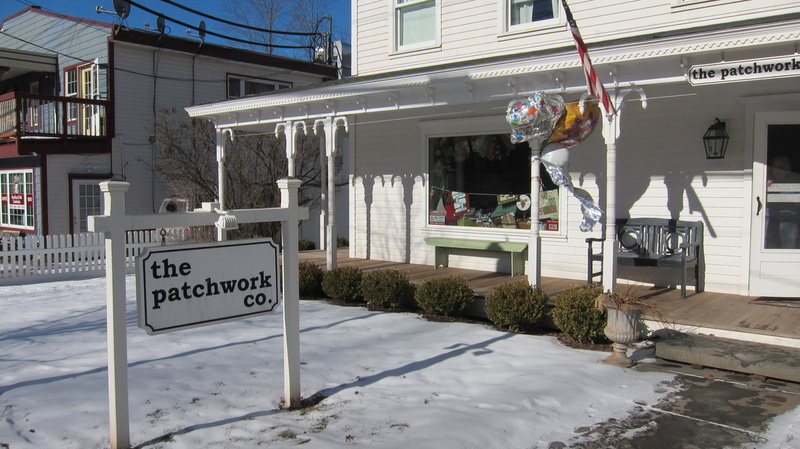 Today is the last day of the 5 year anniversary sale at The Patchwork Company in Windham, NY. You don't want to miss this sale! ALL FABRIC is on sale for just $5 per yard. And there was even fabric left when I left the shop! Pre-cuts, notions, etc. are also on sale 25% off (or more) in the shop. If you can't make the trip - shop online and use the discount code "happy5" at checkout for a 50% discount off fabric! So what are you waiting for?!?!?!??!? Hope 2015 is your best year ever! I received a special "Thank you" e-note from someone I never met. She (Carla) was the recipient of the above quilt. Actually, it was her quilt - the top was made by her great grandmother, but it had never been finished. She had planned to do it herself - but life got in the way and it never happened. My customer brought the top to me and told me the story of how the lost quilt top was found in a cedar chest - in excellent shape - and it is probably 50+ years old. She wanted to present the finished quilt as a group gift to Carla for her 60th birthday. We discussed the potential quilting designs, and the planned deadline. Needless to say - I finished the quilting, added the binding and a special message label to the back. My customer picked it up, and was delighted with the quilt, gave me a hug, and was on her way. And then last week - out of the blue - I receive a lovely email from Carla. She told me how much the quilt meant to her, and all of the cherished memories that came back to her upon seeing the quilt. 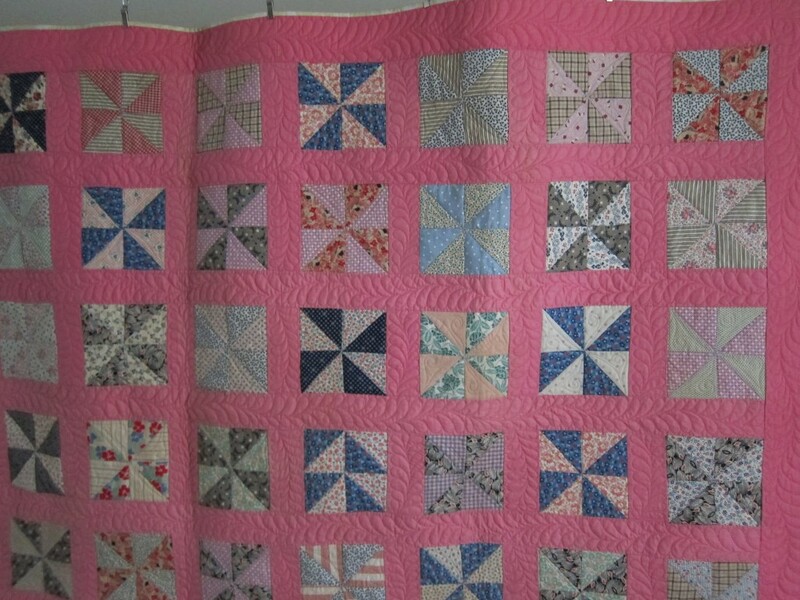 She was thrilled beyond belief with the quilting, and the work put into finishing her cherished memory. I could feel the love coming from her thru the email - something you don't see or feel much of these days of virtual everything. And I am so pleased to have been part of this very special project to bring her memories back to life. I know she will cherish this quilt for the rest of her life. On this day of giving thanks - I wish to thank all of my customers for trusting me with their works of art. May all of your quilts bring the same love and happiness to you and your loved ones as Carla felt with her quilt - for many years to come.